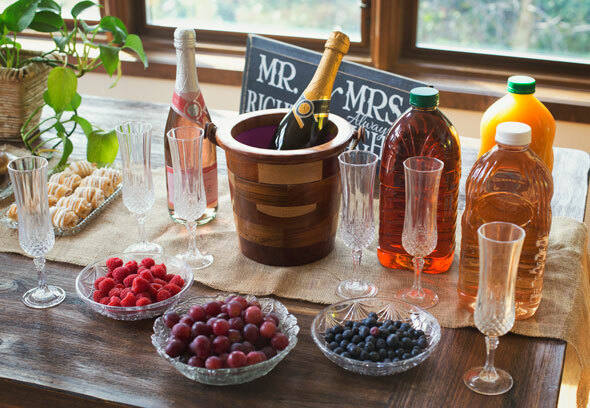 Throwing a bridal shower is one of the best things a bride-to-be can be a part of! There is nothing more special than being “showered” by all of the love from your friends and family before your big day. No matter how you choose to spend this time during your engagement, it can always be looked back on with fond memories and feelings of love and appreciation! What better way to celebrate your love with your closest gals than with a fun champagne brunch bridal shower? What an elegant, yet casual way to mark the occasion and it is such a fun way to shower the bride with a great time! These 5 Ideas For a Champagne Brunch Bridal Shower will help to get you started, with unique ways to set up the brunch, and most importantly, the champagne bar! 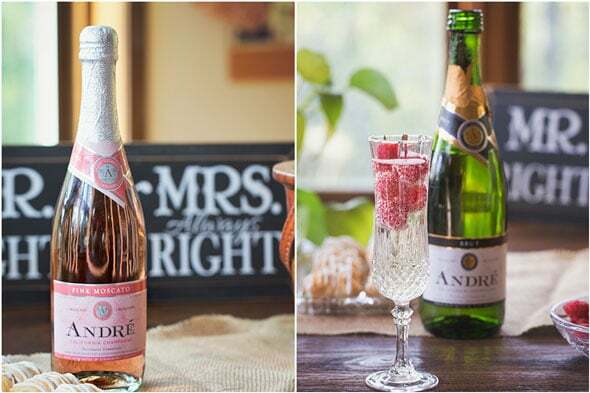 Andre Champagne will help to make your bridal shower brunch nothing but amazing! With just under 10 different affordable champagne varieties to choose from, you’ll be sure to find something for everyone to enjoy. 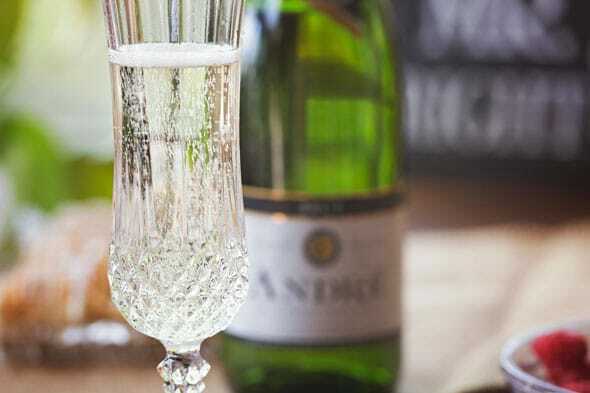 What I love most about Andre Champagne is that with them offering so many varieties, you’re sure to find sweeter bubbly for those who like it, yet find a more dry champagne for those with a discerning palette. If you want to really kick things up a notch for your bridal shower extravaganza, offer different juices for guests so they can make a mimosa, if they so choose! At our shower, we offered orange, pomegranate and white grape juices. Once your guests choose which one they like, they can mix it with their bubbly how they see fit. Add fruit in each champagne glass and it will be even more delightful! At our bubbly bar, we offered blueberries, raspberries and grapes which everyone loved to add for a refreshing flavor throughout the event. 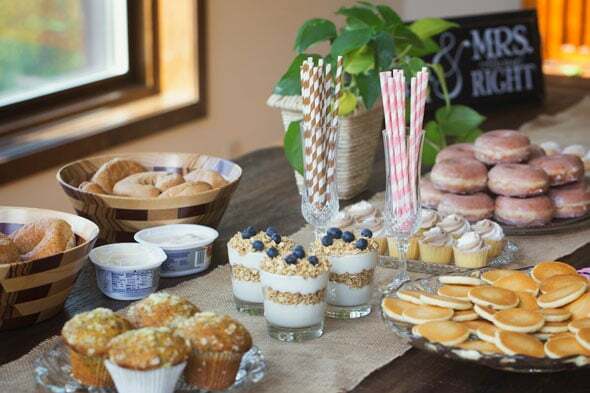 What brunch is complete without breakfast items being offered for your guests? 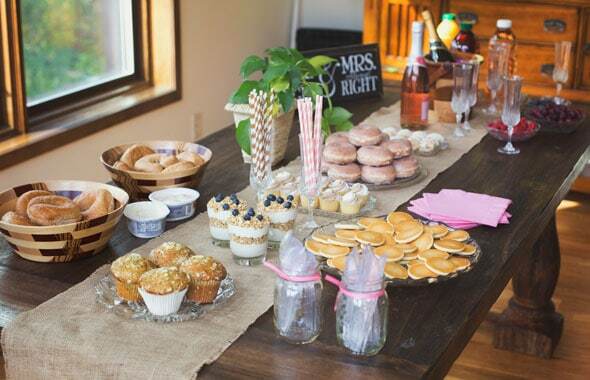 At our champagne brunch bridal shower, mini pancakes were offered with a variety of different types of syrup, including maple, strawberry and blueberry. There were also multiple flavors of bagels offered with different types of complimentary flavored cream cheese. 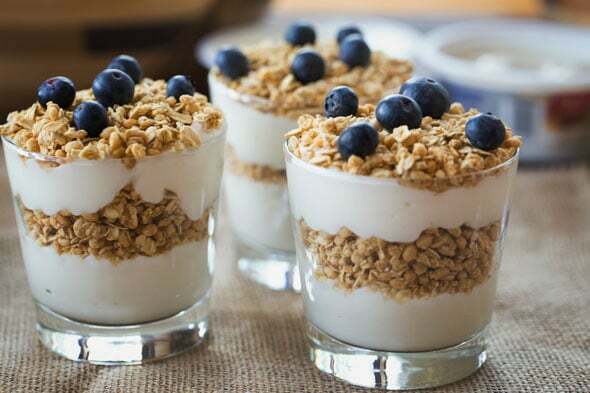 One of the highlights of the breakfast bar was the vanilla yogurt that was in individual serving glasses, and layered with granola. Blueberries garnished the top of each of the glasses and were a hot commodity. Lemon crumble muffins were also served, to everyone’s delight! What would any kind of party be without offering desserts of all kinds?! One of the main focal points of the tablescape for this bridal shower was a glazed donut pyramid that everybody couldn’t wait to dig into! There were also apple cinnamon scones, along with snickerdoodle mini cupcakes! Yum! This is an area where you can get as creative as you want. Just make sure you find out what the bride’s favorite desserts are so you can incorporate them into the dessert section! Bridal showers just HAVE to have some games for guest entertainment! 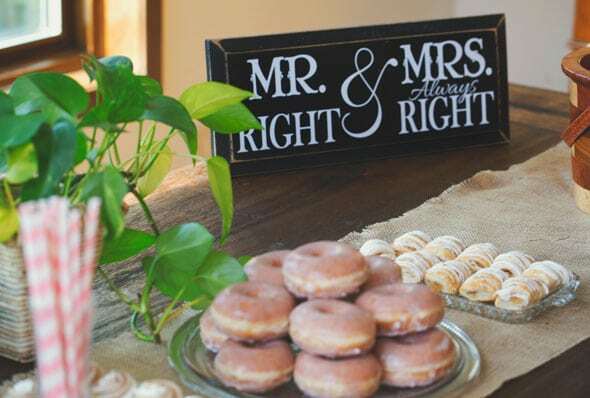 Depending on the comfort level of your bride, you can do games that are wonderfully unique for her. But sticking with more traditional games may help keep the embarrassment out of the event, yet be fun for the bride to be a part of. We love the classic type of games that incorporate the reason why everyone is there … the bride and groom’s relationship! Letters to the couple, where the guest fill in the blanks to different spaces in a pre-built template are always a great way to garner some laughs! And it’s always fun for the bride to read over these later to see the love and advice all of her guests shared with her. Another game, Who Made the First Move, is always a fun one for the guests to do, as well. The bride plays a pivotal role in this game, helping to crown the winner on who gets the most right! Both of these games can be found at Heavens To Betsy. A fun Bridal Bingo game is always a great traditional one, as well. This one hinges on the gifts that the bride will receive. Whoever gets the most in a row correct first, wins! What a great idea over at Something Turquoise! Depending on the style of your bride, you’ll want to make sure you incorporate some of her favorites into the theme of the party. For this champagne bridal brunch, a rustic and laid-back feel set the mood for the event. All things burlap, wood, and crystal were included to draw out the rich and subdued color scheme for the food and champagne bar. And the lovely sign, “Mr. Right & Mrs. Always Right”? What a perfect addition for a bridal shower brunch! Overall, there is nothing more fantastic than a group of girlfriends getting together to celebrate one of their own. 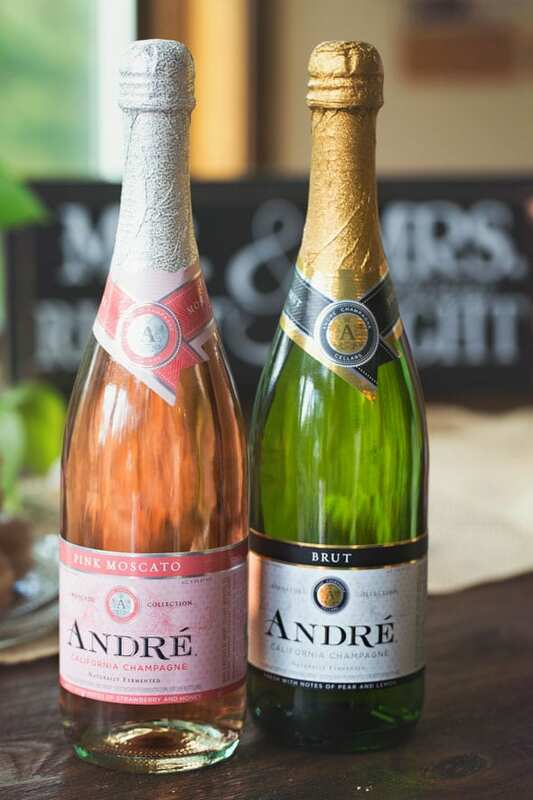 Whether it’s for a bridal shower, a bachelorette party, or just to celebrate someone’s accomplishment, a champagne bar with the help of Andre Champagne is a great way to bring a group of friends together for an amazing and memorable bridal shower! 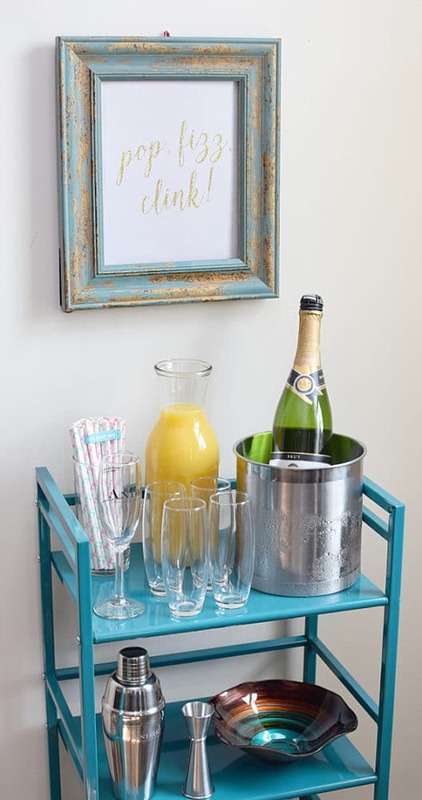 Also, make sure you check out How to Style a Mimosa Bar Cart for your bridal shower!